The opening of “Mama” is intriguing. A car, its driver’s door open, is parked haphazardly in front of a well-kept suburban home where a little girl is choosing a toy — one for an ever so slightly younger child — to bring with her to school. A gunshot is heard, but the child, Victoria, does not recognize it as that. She has no foreboding. We have. (c) 2012, Toma 78/DeMilo Production Co.
Something is amiss. Over these scenes we hear a radio report of financial failures, fraud, and murder. That’s when we meet the totally stressed out father of the child. He bundles his two daughters into the car and drives off, too fast, onto icy roads around the mountain and into the woods. Without telling you something quite startling that occurs, I’ll move on and just say that each step in this story is fraught with dread. From a wild ride then walk through the winter woods, two little girls cling to each other in an empty cabin, without an inkling of what’s going on. The children in this film have been remarkably well cast. In the opening scenes, Morgan McGarry is intelligently precious as young Victoria, wrapping her arms around baby sister Lilly, played by Sierra and Maya Dawe with the simplicity of the small children they are. When the scene advances to five years later, Miss McGarry grows into the lovely Megan Charpentier as Victoria. The baby-faced Isabelle Nélisse is an apt choice for Lilly, with the same drooping apple cheeks as the Dawes. When we meet the girls again after five years alone in the woods, I wonder if young Victoria had been somehow computerized, so similar are the two different girls playing the child. Miss Nélisse’s Lilly is terrifying in her feral nature, and Miss Charpentier’s Victoria heartbreaking as she struggles back to civilization. Uncle Lucas, Annabel, Lilly and Victoria in MAMA. 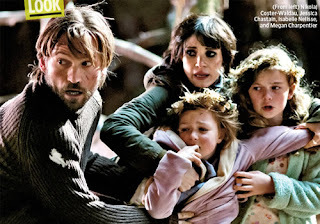 Nikolaj Coster-Waldau as Jeffrey and then Lucas (the Daddy of the girls and then his brother Luke), does straightforward work, but the rollercoaster is ridden by Jessica Chastain as Lucas’ Goth rocker girlfriend Annabel, an unwilling maternal figure who warms to the role when they win custody of the children. After the girls are discovered in the woods, they are treated by Dr. Dreyfuss (a solid performance by Daniel Kash), a doctor with as much imagination as academic knowledge. The adults are very fine in this film, and Chastain continues to build her repertoire of characters, each one different from the last. But it’s the children who are riveting. 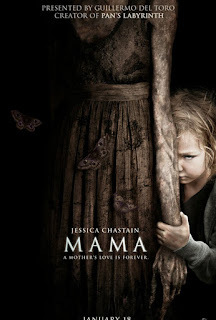 Mama is good, but not great. At times the underscoring was more obvious than ominous, though it never diminished the excellent work by director of photography Antonio Riestra. Director Andrés Muschietti wrote the striking script with his sister Barbara Muschietti and Neil Cross. There is no room for ambiguity in their story. From the first ten minutes (not to mention the trailers and advertising) the ghost is corporeal. Generally I find that less fun than the ambiguity of Robert Wise’s classic film The Haunting, but the influence of executive producer Guillermo del Toro was apparent in the stunning visualization of “Mama.” More importantly, while Shirley Jackson’s heroine in The Haunting thought she sought death with a family of sorts, the anti-heroine of Mama sought family and life after death. The goal of a ghost story is to startle the audience, who should be overcome with shivers, shrieks, gasps, and screams. And some times that gasp could be in wonder at the utterly surprising scenes this film reveals. Not your usual ghost story, Mama is sophisticated, visually polished, and worth your time if you like a good ghost story creatively visualized. From the get-go and throughout, Anna Karenina was breathtaking. Bearing in mind that I read the novel only once several decades ago and am not a purist when it comes to Russian literature, I believe director Joe Wright and screenwriter Tom Stoppard’s conceit for telling this story reached the heart of the matter. Some political ramifications were doubtless lost (despite an early scene that looked as if it could have come from Dr. Zhivago), but it’s clearly the love story (and the fall-out therefrom) that counts in this version. Fittingly, the railroad plays a recurring role in the story of Anna Karenina, and it’s a marvelous vehicle — snow-covered, city to country, country to city, mixing people, gentry, serf, drones. It separates young lovers, then joins them, then separates again. Nothing’s more thrilling than a train ride through the movies. The theatricality of the entire enterprise was a never-ending delight. I was hooked from my first sight of the stage, the bird’s eye view available from the upper levels of the theatre, characters looking down on the room they just left, and turning turning turning to walk out of the stage set into a field of whatever it is that Domhnall Gleeson’s Constantine Levin and his freed serfs scythe. 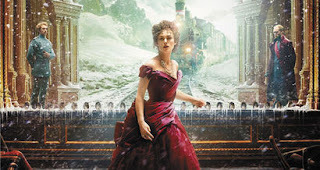 Visually splendid are the actors as well, with the traffic-stopping Keira Knightley as Anna Karenina in stunning costumes by Jacqueline Durran. Costumes and settings and certainly Ms. Knightley’s jewelry did not adhere strictly to the time period any more than the ballroom dancing did, but who could care if beauty took a left turn for a joyride. The dancing in particular was fanciful and clever and quite possibly the way the lower classes might have imagined the upper classes to have moved in those overly ornate rooms, as if a luxurious birth afforded people grace and rhythm to do the complicated, flowing movements. 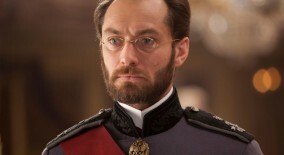 Who hasn’t said, to themselves or aloud, that just a few years ago it would have been Jude Law as Vronsky, and wouldn’t that have been swell. Well, yes, but I’m happy to see him grow into the mature man he is, playing surprising roles for the joy of it. Jude Law does some of his very best work, subdued and thoughtful, as the properly repressed yet unalterably kind Alexei Karenin. 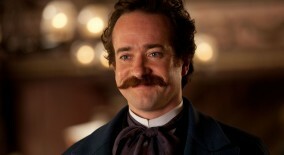 Matthew Macfadyen put aside his often dour countenance to be a playful brother to Anna as the philandering Oblonsky. The wonderful Kelly Macdonald represented all women as betrayed wife Dolly. Her reaction to Anna’s behavior is yearning and admiring, in sharp contrast to the women of high society, exemplified by Shirley Henderson as an unknown woman at the opera, where everyone recognizes Anna. In contrast, Princess Myagkaya (an elegant Michelle Dockery) was empowered with the strength to be loyal. Country fellow Levin loves the lovely Kitty (a sweet, sullen, then warm and tender Alicia Vikander), who is smitten with the dashing Vronsky (a seductive Aaron Taylor-Johnson), who dooms Anna Karenina as quickly as he falls for her. The lovely Ms. Knightley and delicious Mr. Taylor-Johnson are beautifully intertwined throughout the film. Emily Watson was morose as usual as Karenin’s friend, the Countess Ivanova. She represents her times well in its beginnings of forward-thinking actions by privileged classes, fighting for social equality for all except her own gender. Mr. Wright’s direction is bold and exciting, aided by gorgeous cinematography by Seamus McGarvey, expert film editing by Melanie Oliver, an extraordinary production design by Sarah Greenwood that combined imagination and history, allowing the imagination to win. All of this was accompanied by a thrilling and moving score by Dario Marianelli. As I left the theatre, I saw a poster for A Royal Affair and recognized Alicia Vikander who had just played the delightful Kitty. While that hadn’t been on my short list of films to see (isn’t winter swell, though, sending us indoors even in daylight to keep warm in the movie house? ), but Ms. Vikander’s lustrous performance in Anna Karenina may yet move A Royal Affair up the list. 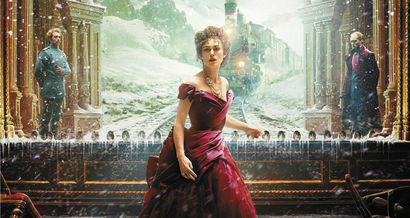 If Anna Karenina is still playing on a big screen near you, go enjoy the visual splendor. If you’re a Russian literature purist, I can’t help you but to say it’s a fine film in and of itself. Read the book again later. Much later. ~ Molly Matera, signing off to read a good book…. Quentin Tarantino loves his arterial spray. Geysers of it, in fact. For his fans looking for that sort of thing, Django Unchained did not disappoint. Something did though. 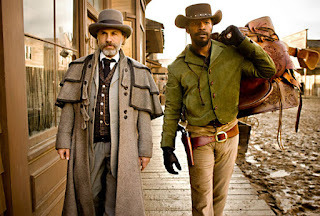 Christoph Walz as Dr. Schulz and Jamie Foxx as Django. 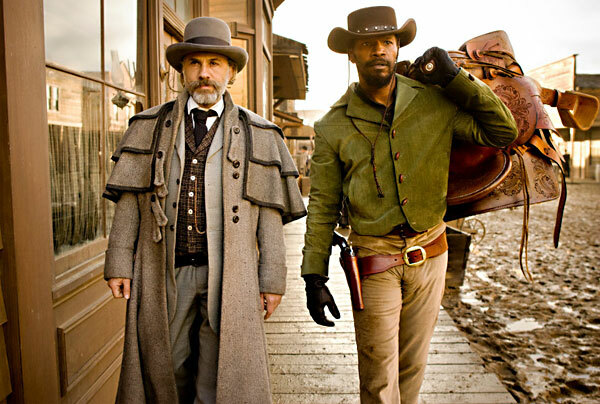 Django Unchained was sort of fun while it lasted. Christoph Waltz as Dr. Schulz is brilliant, hilarious, and perversely lovable, as is his little traveling dentist’s wagon. Jamie Fox does good work growing from a slave who barely raises his head to a free man on a mission. And it was fun to pick out all the old TV/movie cowboys in the cast (Bruce Dern, Don Stroud, Lee Horsley, Michael Parks among others) and other “cameos” by Tom Wopat, Russ Tamblyn and his daughter Amber, not to mention Mr. Tarantino himself. Yes, it’s a self-referential Hollywood western film, and pure Tarantino — a revenge masquerade on people who deserve the punishment. There was a lot of excellent work by the likes of Don Johnson as a southern slaveowner as well as Dennis Christopher as a sycophantic family lawyer. Before I sound like the Academy Awards, I will take note of Leonardo DiCaprio’s slimy and marvelous work as Calvin Candie of the Candyland plantation, one of the most despicable characters ever seen on the screen. Kerry Washington was beautiful and heartbreaking, Walton Goggins perfectly repulsive, and Laura Cayouette was creepily fragile as Candie’s widowed sister. This was all topped off with an unpleasant performance by Samuel L. Jackson, whom I did not even recognize until halfway through his first scene. Unpleasant. This film is unpleasant. 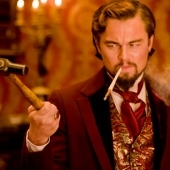 Many scenes in Django Unchained — perhaps I should say most — are deeply disturbing, and Mr. Tarantino may have been right to shove it down our throats. Nevertheless, there’s really only so much blood and gore I can watch before it — dare I say — bores me. While I sort of enjoyed the film as I watched and cringed and sometimes put my hands over my eyes, I really was not inspired to read or write or urge others to see this movie. Loved the soundtrack, though. Django Unchained is a little too long and a little too much, but while it is not likely to win him new fans, Mr. Tarantino’s work has plenty of fans who will probably love it. In December, I saw the quietly delightful Red Bull Theater production of Volpone or The Fox during its limited run. Ben Jonson’s moralistic comedy shows the deteriorating mores and hypocrisy of Venetian society circa 1607 and is remarkably funny until everyone comes to their just ends, which were rather harsh in the 17th century. The production at the Lucille Lortel Theatre starred a sparkling Stephen Spinella as Volpone accompanied by a sleazy Cameron Fomar as Mosca, his “Parasite.” These two were joined by the unerring Alvin Epstein as Corbaccio, with a saucy turn by Tovah Feldshuh as the English Lady. Even Christina Pumariega in what could easily have been the thankless role of the Merchant’s wife was a delight. The entire cast shone under the tiptop, brisk, funny direction of Artistic Director Jesse Berger. 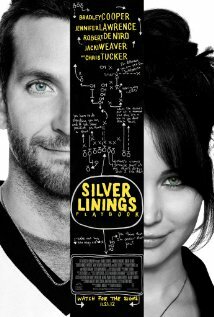 I liked Silver Linings Playbook. I didn’t love it. Largely because by the end I felt it was a crock. Early on, even halfway through, the mental issues of the characters were, so far I could see, honestly portrayed. There is humor, compassion, crazy people, misunderstandings, and a lot of laughs. Then suddenly love conquers all. Oh well. It was fun while it lasted. David O. Russell, directing his own screenplay based on a novel by Matthew Quick, has a splendid cast and they all have a rollicking good time, as does the audience. Bradley Cooper is the damaged young man who is just getting out of a psychiatric institution where he was incarcerated after his violent attack on his wife’s lover. Pat (Junior) seems like a nice guy, looking for a positive way to view life — and then he loses it, for no good reason. We see and hear the cues, but they are not good reasons for a sane person to trash the attic room or wake people at 4 in the morning. Of course he doesn’t want to take his meds, or see his shrink (a warm and fuzzy Anupam Kher), or abide by the restraining order his wife Nikki has out on him, which Officer Keogh (Dash Mihok) is prepared to enforce. In fact, the whole neighborhood seems ready to enforce it. The reaction of Pat's former employer (an excellent scene for Patsy Meck as the high school principal) when he approaches her tells us just how scary this guy was. Pat’s parents are played by the remarkable Robert DeNiro and Jacki Weaver. This woman is amazing, such a wonderful mother, loving, protective, tolerant of her sons and her husband. It’s as if she and DeNiro and been married for decades, they all fit together perfectly. To watch these two performances alone, this film is worth anyone’s time. Back to Pat — all of Pat’s behavior is suspect, all of it is self-destructive, and he believes he and his wife have an amazing love and will get over this little bump in the road. He is the only one in the film and in the theatre who believes that for a moment. Pat visits an old friend (John Ortiz as Ronnie), married to Veronica (a good job by Julia Stiles) who is a friend of the estranged wife, Nikki. Underdressed at dinner with Ronnie and Veronica he meets Veronica’s little sister Tiffany, young, recently widowed, and with problems of her own. These two first connect over the medications they dislike. Jennifer Lawrence gives a terrific performance as a tough girl who appears to be fighting for her life. And then she’s fighting for Pat’s. All of this through dance. The visit from Danny, Pat’s friend from the mental institution as played by a delightful Chris Tucker, adds some pizzazz to that dance routine. Cooper at Pat, Lawrence as Tiffany, and Tucker as Danny. The film is fun, the characters engaging — even when we really want them to take their meds — and the insanity of “normal” people over sports events is delightfully portrayed. Americans’ relationship with sports plays a part in this story, as does gambling, as do anger management issues…. The apple did not fall far from the tree, is all I need say. So up until the last few scenes, I quite enjoyed being all positive with Pat and his parents and his friends. I am well aware that film compresses time and events, but really. Love does not conquer all, and I found the final scenes of “normalcy” to be quite annoying. Nevertheless, all the performances are quite good, with outstanding work by Mr. DeNiro and Ms. Weaver. ~ Molly Matera, signing off until next time.